2. Offer valid for all room categories at any Sandals Resort (excluding INN). 3. 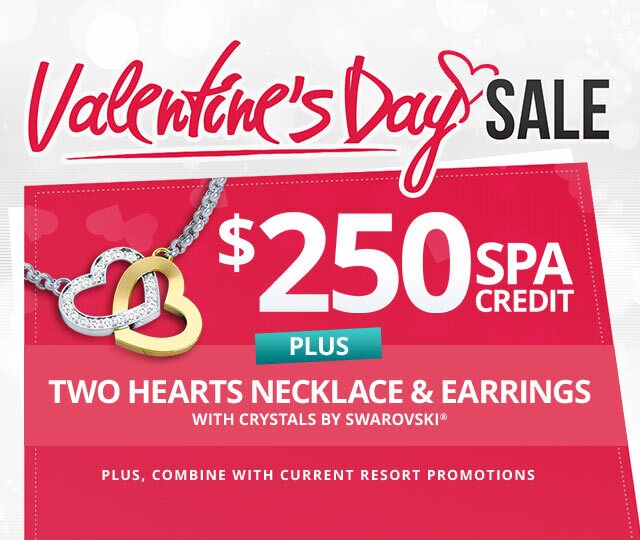 Sandals Resorts bookings are eligible to receive a $250 spa credit and Two Hearts Necklace & Earrings Gift Set with Crystals by Swarovski® . 4. Offers valid for bookings made on February 9, 2019 &dash; February 15, 2019. 5. Offers valid for bookings traveling February 9, 2019 &dash; December 26, 2020; blackout dates apply. 6. Offer valid for one qualifying stay of at least six (6) PAID nights. 7. Blackout Dates and Travel Dates are as specified in our Standard Promotional Conditions. 8. Registration is required to receive promotional offer. The UVI booking number must be entered on the registration page. 9. Guests or TA’s MUST REGISTER their booking within 72 hours of creating the booking on https://www.sandals.com/valentines-day-registration/. 10. LATAM bookings are ineligible to receive the physical gift of the Two Hearts Necklace & Earrings Gift Set with Crystals by Swarovski®. 11. Canadian guests with Canadian mailing addresses must enter their phone number on the promotion’s registration page online in order for them to receive their physical gift. 13. The Two Hearts Necklace & Earrings Gift Set with Crystals by Swarovski® will be distributed 6&dash;8 weeks post&dash;travel, timing may exceed depending on travel dates. 14. Product and color may vary from the product in the image. 15. Gifts cannot be mailed to P.O. boxes. 16. The spa credit and services must be redeemed on resort at the Red Lane® Spa and during the applicable stay. 17. The offers are not redeemable for cash and cannot be used to pay the balance of any booking, applicable tax, service charge, or gratuity. They have no cash value and cannot be sold or exchanged. 18. This promotion is not applicable to contracted Groups.